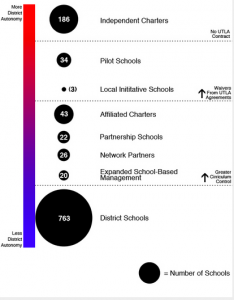 It’s not just about 186 independent charter schools and 763 public schools in LA anymore. Nowadays, there are eight different school models, each with a different level of autonomy. Last week, we told you about Steve Barr’s interest in starting pilot schools, which are small schools with under 500 kids that operate within the district but can also obtain waivers from labor agreements– the closest thing to an autonomous charter. And, according to this handy-dandy chart we can tell you that there are 34 of them. 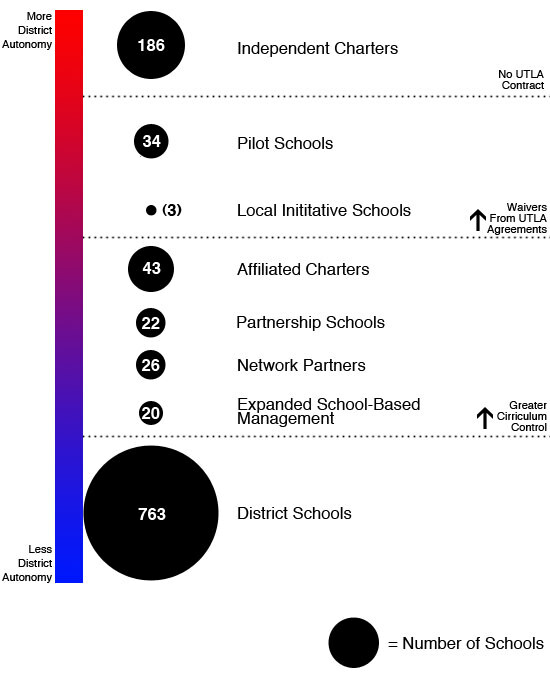 Other types of schools include local initiative schools (2), affiliated charters (43), partnership schools (22), network partners (26), and expanded school-based management schools (20). Read below to see the chart in full size and to get a description of each model showing where each model falls on the spectrum of autonomy from LAUSD and UTLA. We’ll tell you more about each model in future posts. District Schools: Your basic, run of the mill public schools, including magnets, special ed, and few more. Expanded School-Based Management: Also known as ESBMM, these schools are run by a School Leadership Council. Network Partners: Schools partnered with an external organization– for example, L.A.’s Promise. Partnership Schools: Started by Mayor Villaraigosa in 2007, Partnership Schools have budgetary and management independence, but use existing attendance boundaries and labor agreements. Affiliated Charters: Approved by the school board, they utilize LAUSD facilities and adhere to UTLA contracts. Pilot Schools: Small schools with under 500 kids, they can also obtain waivers from labor agreements. Independent Charters: Fully autonomous (but publicly funded) schools, with an independent board of directors, completely exempt from LAUSD labor agreements. They can admit students from all over the city and raise money to augment their budgets.